Margaret Court Arena, closes completely in under five minutes and is ready to cover players and spectators during the 2015 Australian Open. Populous, is the fastest to close in Australia. According to Architecture and Design, the roof is a part of the latest redevelopment phase at Melbourne Olympic Parks. 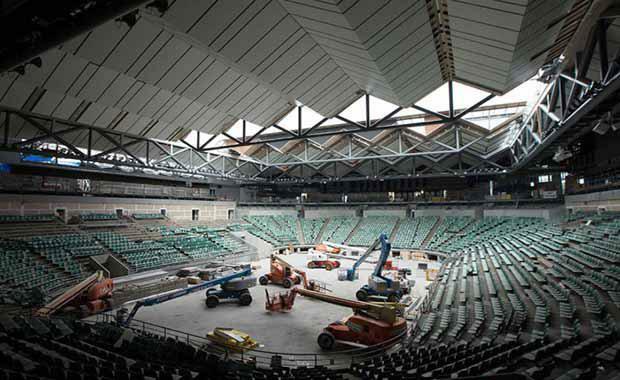 It also includes a refurbished MCA seating bowl to hold 7,500 spectators, new air conditioning and acoustic technologies and concourse connectivity to the Rod Laver Arena. The new roof has attracted attention with reviews of the design coming in mixed and from international sources. America’s Sports Illustrated Magazine claimed the design had “grandeur” and was “fashionable”, while Joe Rollo from Australia’s Fairfax Media says the MCA design is a missed chance at greatness. Populous Senior Principal Richard Breslin claims the roof’s colour and profile reflected some traditional elements of Melbourne architecture, while still endeavouring to create a presence of individuality for the MCA. “The “copper penny” colour of the metal roof has been deliberately designed to complement the existing architecture, particularly big brother next door, Rod Laver Arena, but also to express Margaret Court Arena’s own individuality,” he said in a statement. He also said the pleated profile reduces its structural depth and importantly reduces the visual bulk of the building. The roof, designed with guidance from Aurecon and Walter P Moore engineers, is a unique system, which sees only two downturned operable trusses, spanning the width of the MCA (on each end), supporting the bulk of the operable roof. Each truss is connected to a 57 metre x 32 metre operable lateral panel, which is joined to seven adjacent gable roofs sections that make up the bulk of the MCA roof. The whole structure is driven by drive bogies and has a small straight-line dimension of 1.25 metres between the top of the operable roof panel and the top of the fixed roof. While the primary use of the redeveloped Margaret Court Arena will be to stage major matches of the Australian Tennis Open, the multi-purpose venue will also host netball, basketball, major concerts and entertainment events.